Learn how to use peppermint essential oil 5 different ways! Peppermint oil is great for relieving congestion, increasing energy and focus, and helps with gas. It's versatile and is a great entry point for other essential oils! 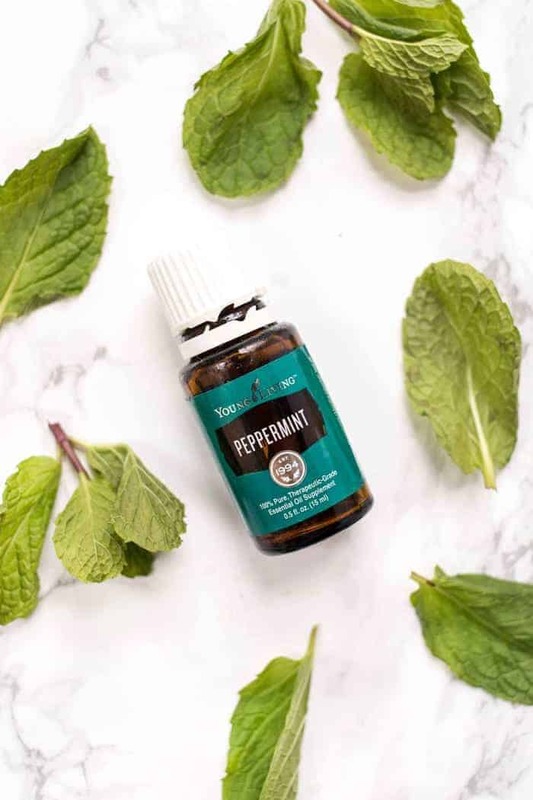 Last week we chatted about how to use lavender essential oil, and today we're moving on to my second favorite oil: peppermint! 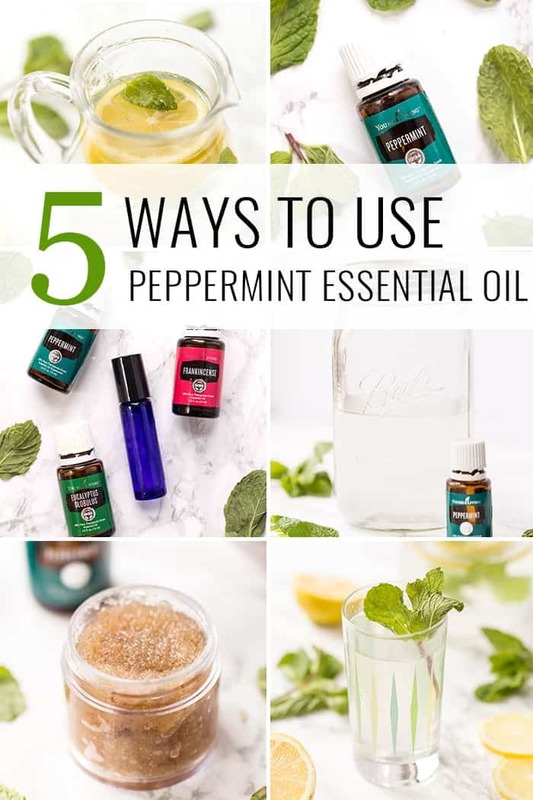 I'm going to show you another 5 ways to use peppermint essential oil, including an amazing de-bloating/gas relief water and a lip scrub! 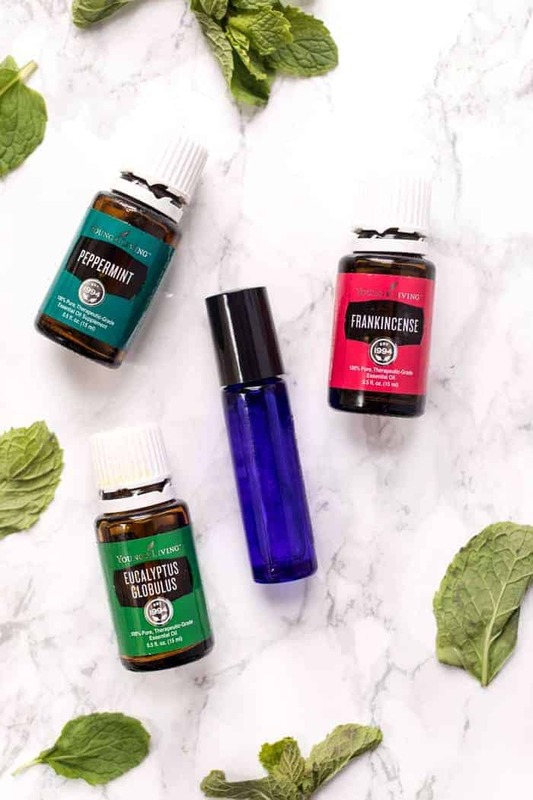 What I personally love about peppermint essential oil, aside from the minty fresh smell, is that it can be used both aromatically as well as mixed with food/drink! In this post, I'll give you my 5 favorite ways to use peppermint in everyday life! One of the most common ways to use peppermint essential oil is to simply inhale the scent directly from the bottle. It couldn't be any easier, right? You just unscrew the lid, hold the bottle just below your nostrils, and take a few deep breaths. Peppermint is one of the only oils that I actually ingest. Likely that's because it's a familiar taste to me, but there are definitely benefits to taking peppermint essential oil internally, especially for digestion. One of my favorite ways is to mix it with some lemon and water. 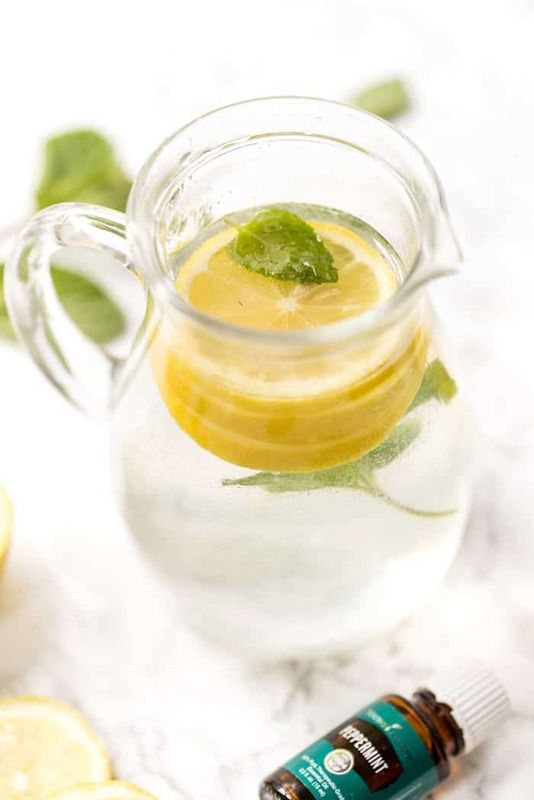 I call this my de-bloating/gas relief water as the peppermint and lemon combined are great for your digestion. 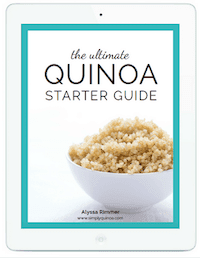 This recipe is for 8oz of water, but feel free to double, triple, etc. Sometimes I'll even just keep some in my fridge if I have an upset tummy. Add the oil, water and lemon juice into a glass or pitcher. Whisk vigorously to get the oil mixed in, and add the fresh lemon and mint. Drink slowly and enjoy the digestion benefits! Since peppermint is so fresh and minty, it's great for using in an energizing sugar scrub! 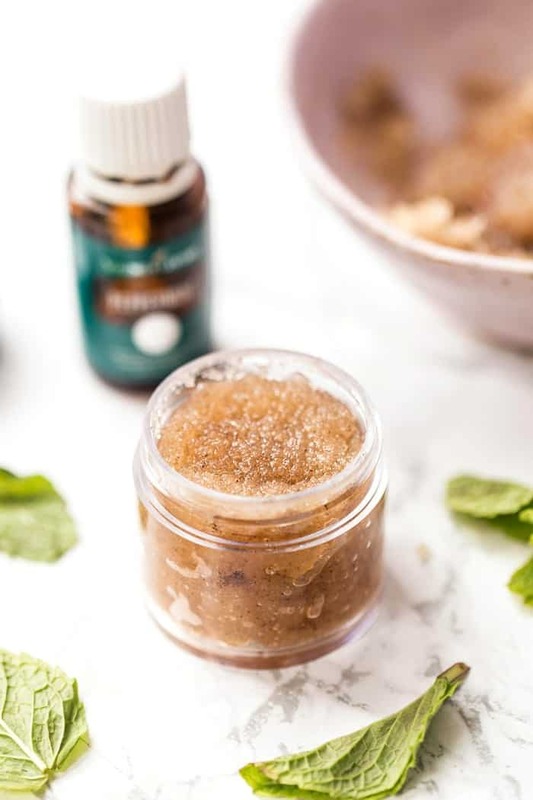 You could certainly make the same body scrub we made last week, just substituting the lavender for peppermint, but I'm going to show you an alternative that I just adore. It's a sugar scrub for your lips! If you're anything like me, the winter is brutal on your lips. I almost always have some sort of chap going on, so this scrub is a lifesaver. It exfoliates my lips, gets rid of dry skin and moisturizes all at the same time. 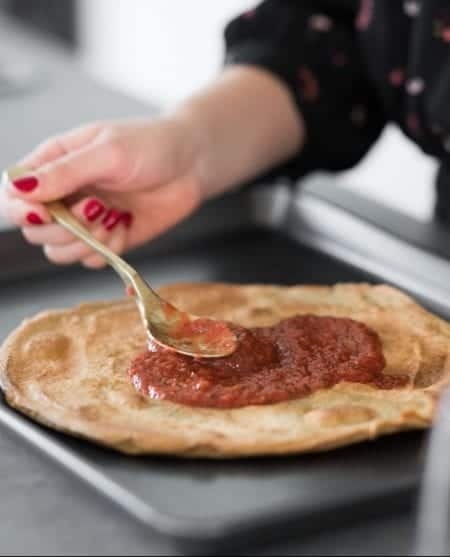 And it couldn't be easier to make! 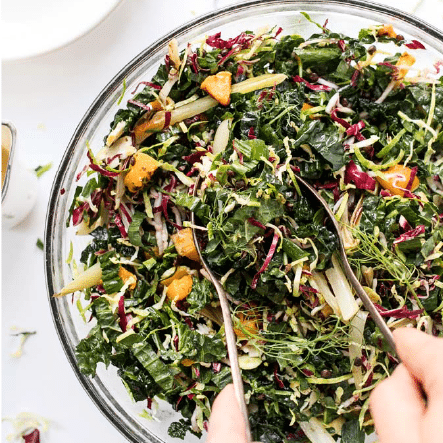 Stir everything together in a small bowl. Transfer the mixture into small containers and store at room temperature. Use once or twice per week, or as needed. When you're done scrubbing, wipe it off with a wet towel! I've tried switching to natural mouthwash before, but I just can't seem to find one I like. The natural ones taste terrible, and the ones that taste good are full of ingredients that I don't want to put in my body. So when I discovered you can make mouthwash at home, I was pumped! 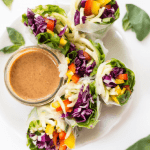 Not only is this simple to make (it only uses 3 ingredients! ), but it's also incredibly budget-friendly. You can make big batches at a time and your mouth will be left feeling minty fresh! Add everything into a mason jar. Screw on the lid and give it a good shake! Store this in your bathroom and use once or twice per day. I like to give mine a little shake before use to make sure everything is nice and mixed! Our final ways to use peppermint essential oil is to make our own roller bottle mixture. We talked about roller bottles last week, but this one is perfect for when you're feeling congested and stuffed up. It will open up your airways, help clear out congestion and hopefully help you rest a little easier at night. Add the essential oils to the bottom of your roller bottle. Top with your carrier oil of choice (mine was coconut), pop on the lid and give the bottle a good shake. To use, roll the oils on the bottom of your feet, on your wrists, behind your ears and/or on your chest. Take a few deep breaths and clear it all out! Essential oils became a big part of my life. Sometimes I use peppermint oil, but always lavender and orange! 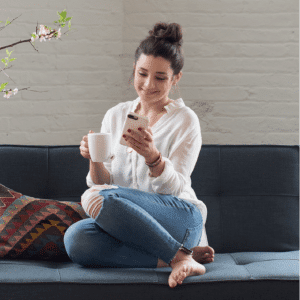 Can I pin this post on my Pinterest board!? My followers will love it. My friend have been gushing about essential oils and how they are amazing! Now, I’m convinced to try and incorporate it during my diy foot spa session at home. Also, thanks for these diy ideas. Really helpful! Great information! I’m going in to get my essential oils right now. Donde se puede comprar el aceite Donde se puede comprar el Aceite Esencial de menta ? puede ayudarme ? Essential oils are so great!! I use peppermint on my temples when I have a headache.